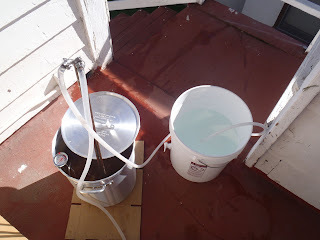 Chism Brewing Voyage: Super efficient wort chilling method - knock nearly an hour off chilling time! When I first started brewing, I used an immersion chiller and an ice bath to cool the wort from boiling down to yeast pitchable temperatures (approx 68 degrees). This method was painstakingly slow, requiring about 60 minutes to reach this temperature, a lot of water, and about 40 lbs of ice. I would usually try to recycle the water (see bucket in photo below) to water plants. After carrying dozens of buckets up and down my stairs a couple times, I gave up on that. 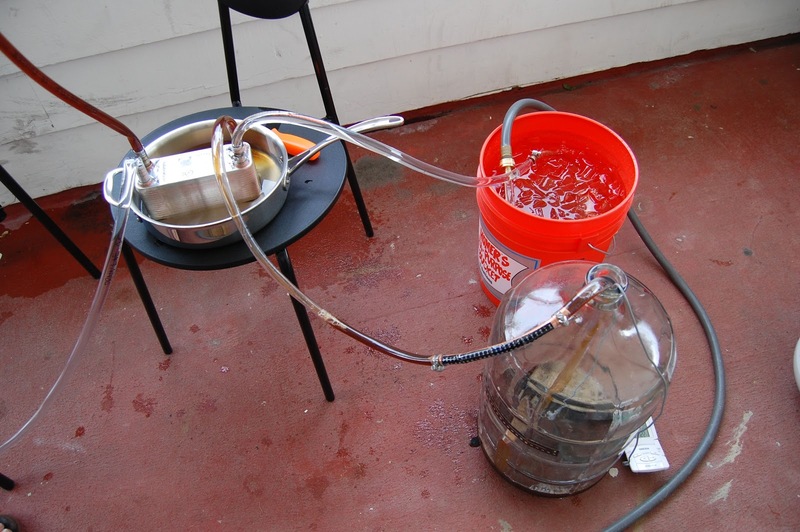 I did some research and discovered I could cool my beer in 5-10 minutes if I used a plate chiller. I blogged about this method in this post: Plate Chiller is Ready for Maiden Voyage. In addition to the plate chiller I set up a "pre-chiller" to cool the incoming tap water down to approximately 50 to 55 degrees prior to passing through the plate chiller to ultimately cool the wort. In the photos below, you can see the copper coil pre-chiller (the coil in the photo on top is set in the orange ice bucket in the photo on the bottom), plate chiller (on the chair), and the lines coming out of the kettle, through the plate chiller and into the primary fermenter (glass carboy). I reconfigured my chiller set up so that the tap water would run directly into the plate chiller, without "pre-chilling" the water. The wort would then pass through the plate chiller, then through the copper coil in the ice bath. Since I don't have a pump to transfer the wort between the various vessels, I have to use gravity to do all the transferring for me. I was concerned I wouldn't have enough head pressure in the kettle to push all the wort from the kettle, through all my contraptions, and into the fermenter. I solved this by elevating the kettle higher than normal. 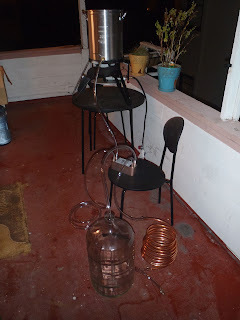 I got it up about 5 feet above the ground, by placing it on top of my cooler mash tun, then stepped the plate chiller and copper coil chiller down from there. This method is definitely the ticket for cooling wort quickly. I opened the kettle ball valve about half way and the wort had no problem making its way into the fermenter. It came out at 50 degrees! I immediately opened the kettle all the way, and the 6 gallons of wort was chilled to 64 degrees in 5 minutes! The set up may look extremely ghetto, but hey! you can't knock how effective it is! Nope, it doesn't leak unless I don't have teflon on the hose barb or the hose clamp tightened all the way. I need to post an update to this with my pump hooked up to it. 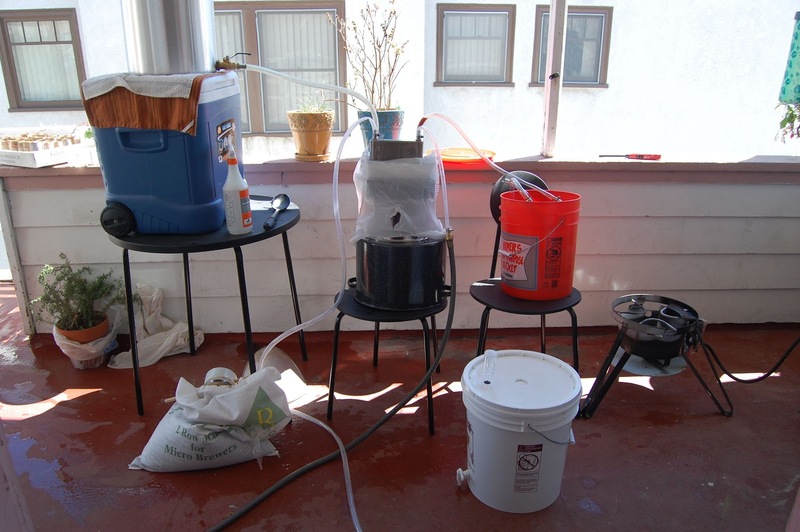 Makes it so much easier to chill without lifting the pots, which I can't do anymore since I'm brewing 10 gallons at a time.